Who is my hero? That is a hard question because I think that there are tons of people out there that are heroes. I think that I would consider my grandmother a hero because she has faced so much. 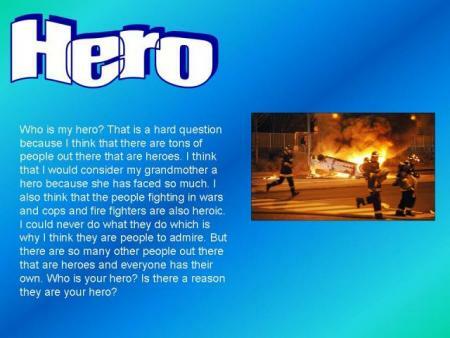 I also think that the people fighting in wars and cops and fire fighters are also heroic. I could never do what they do which is why I think they are people to admire. But there are so many other people out there that are heroes and everyone has their own. Who is your hero? Is there a reason they are your hero?